Before you begin scrolling through our writing center presentations menu there are two things that we would like to remind you of when working with our facility. While scrolling, if there is a presentation that you would like for one of our staff members to provide to your class, please go to our writing center web-page and fill out a writing center classroom visit request form to schedule and appointment. Please make sure to include your name, the course you teach, the classroom location and time that you meet. In the event that you did not see a presentation description that suited your course’s needs, no worries! We at the PSC Writing and Career Lab can hand-craft a personalized presentation to fit you and your students course requirements. If you have an idea of what type of writing-related presentation you would like us to design for you, please contact us at writingcoaches@paulsmiths.edu to inquire about an individualized presentation. 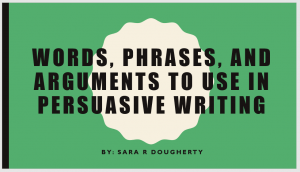 Our Writing Center Argumentative Papers Presentation helps students better understand writing with a stance, using voice, and supporting an argument with informative facts and examples. 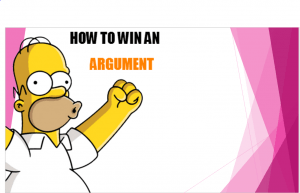 This power point presentation reviews the structure of argumentative papers, evidential support, along with types of claims. We provide students with examples of supported claims using APA/MLA cited resources and remind students of the importance of valid research.This is a multidisciplinary presentation that can be used within courses that deal with case-studies, lab & data collection reports, or persuasive research papers. 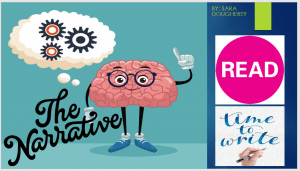 If you’d like this presentation to be given in one of your courses, feel free to reach out to writingcoaches@paulsmiths.edu to inquire about a classroom visit! 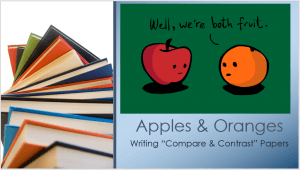 Our Writing Center Compare and Contrast Presentation help student understand the basic components of compare and contrast assignments. This is a multidisciplinary presentation that can be used within courses that deal with case-studies, lab & data collection reports, or persuasive research papers. This presentation reminds students of the basics of comparing two (+) items in writing versus contrasting them. We focus on language use, phrases, and how to construct a paper that showcases the authors ideas clearly in an organized manner. If you’d like this presentation to be given in one of your courses, feel free to reach out to writingcoaches@paulsmiths.edu to inquire about a classroom visit! Our Writing Center Persuasive Vocabulary Presentation help the student body better understand the proper words, phrases, and arguments to use in persuasive writing. This is a multidisciplinary presentation that can be used within courses that deal with case-studies, lab and data collection reports or research papers in which students are asked to take a stance. 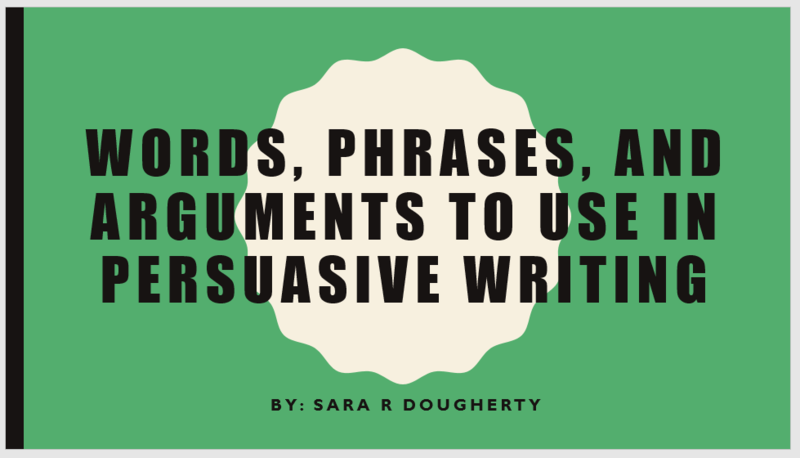 This presentation provides students with multiple persuasive writing examples for them to analyze and mimic in their own writing assignments. If you’d like this presentation to be given in one of your courses, feel free to reach out to writingcoaches@paulsmiths.edu to inquire about a classroom visit. 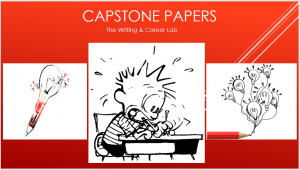 Our Writing Center Capstone Paper Presentation helps students understand the process of creating, planning, and executing a capstone paper & presentation. This presentation includes an overview of APA & MLA format along with style guidelines for PSC Capstone Projects. 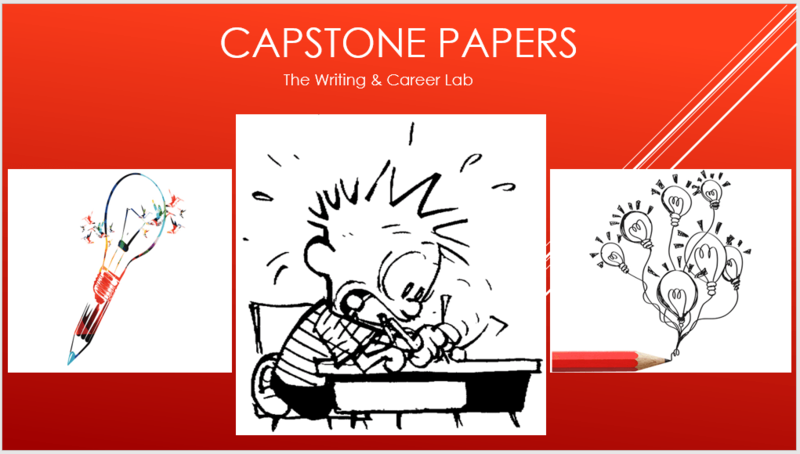 Within the presentation, we include the specific requirements for the college’s capstone papers and outline examples that student’s can reference. We inform students of research methods, source credibility, constructing and drafting a capstone paper, and how to organize the final presentation/ poster project. If you’d like this presentation to be given in one of your courses, feel free to reach out to writingcoaches@paulsmiths.edu to inquire about a classroom visit. 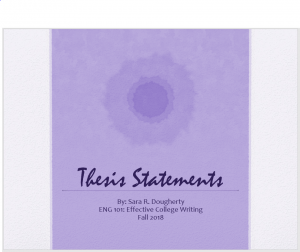 Our Writing Center Thesis Presentation helps students begin to understand the process of developing a thesis statement for their independent research papers. This is a multidisciplinary presentation that can be used within courses that deal with case-studies, lab & data collection reports, or persuasive research papers. 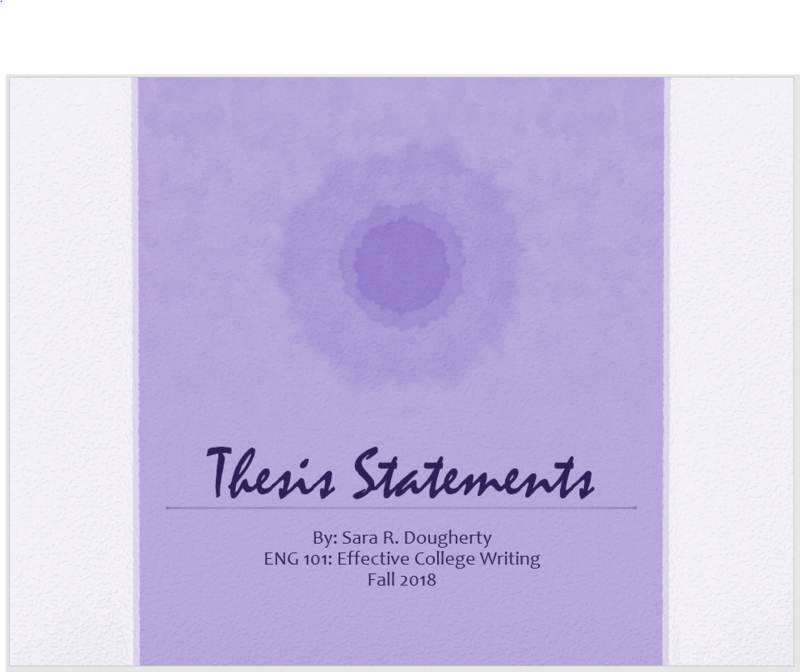 Within this presentation we provide students with the chance to observe well-crafted thesis statements and to compare them to thesis statements that are considered incomplete or weak. If you’d like this presentation to be given in one of your courses, feel free to reach out to writingcoaches@paulsmiths.edu to inquire about a classroom visit. 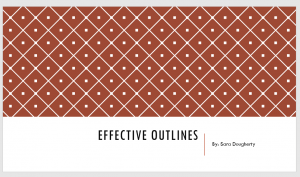 Our Writing Center Effective Outlining Presentation helps your students better understand the importance of using an outline when drafting your papers and how to properly create one. 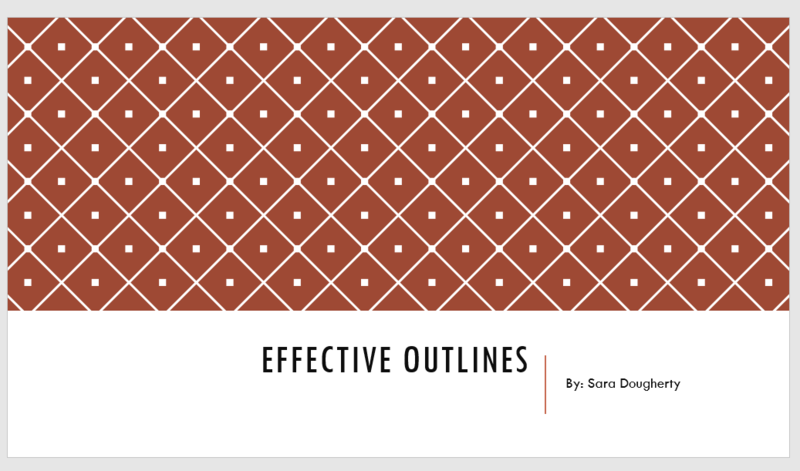 This presentation teaches students the technique of reverse outlining and how to properly organize thoughts in an outline before drafting the paper.If you’d like this presentation to be given in one of your courses, feel free to reach out to writingcoaches@paulsmiths.edu to inquire about a classroom visit. 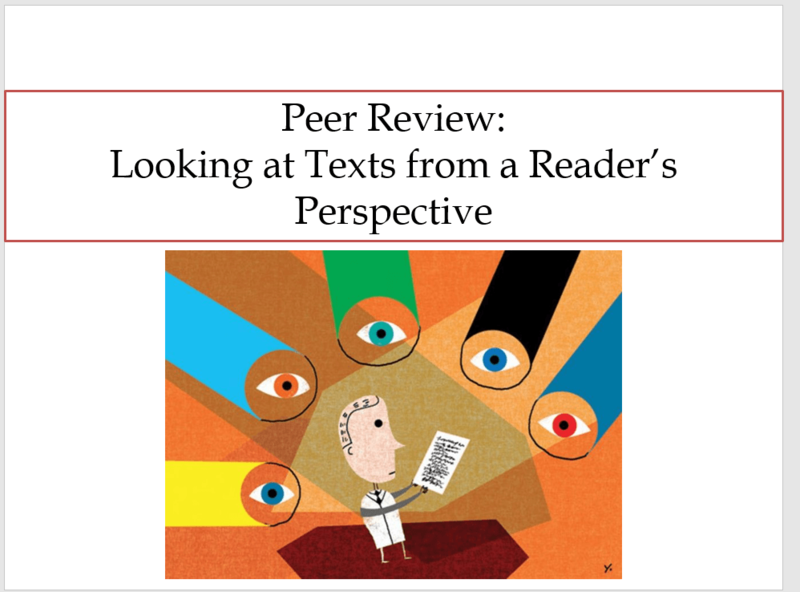 Our Writing Center Peer Review Presentation help students better understand the importance of practicing peer review exercises. This is a multidisciplinary presentation that can be used within courses that deal with case-studies, lab & data collection reports, or persuasive research papers. We examine who participates in peer-review, types of peer review, and how to properly provide constructive criticisms about others writing. If you’d like this presentation to be given in one of your courses, feel free to reach out to writingcoaches@paulsmiths.edu to inquire about a classroom visit. 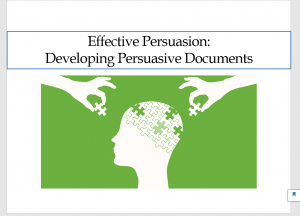 Our Writing Center Effective Persuasion Presentation provides students with an overview of persuasive context, reminds students of the importance of recognizing their audience, and what type of research they should be including into their papers in order to appear credible in the readers eyes. This is a multidisciplinary presentation that can be used within courses that deal with case-studies, lab & data collection reports, or persuasive research papers. If you’d like this presentation to be given in one of your courses, feel free to reach out to writingcoaches@paulsmiths.edu to inquire about a classroom visit. 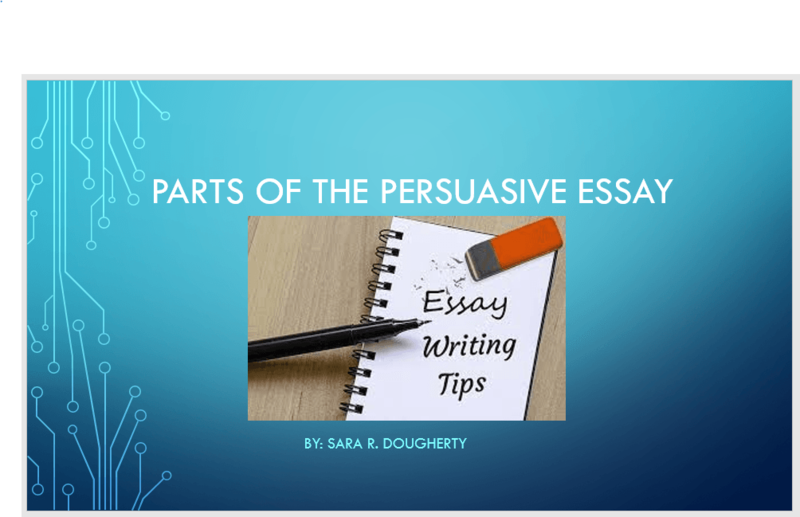 Our Writing Center Parts of a Persuasive Essay Presentation provides students with examples of the parts they should include in persuasive writing assignments. 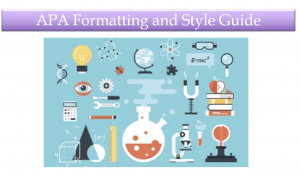 We show students examples of well supported introductions, body paragraphs, great concession writing samples, and how to craft a strong conclusion. 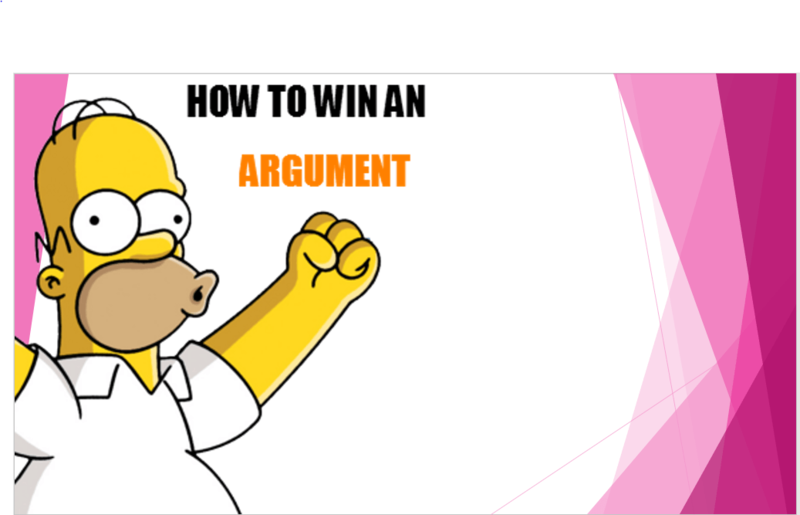 Within this presentation we teach students how to properly cite their sources to provide credibility to their arguments. This is a multidisciplinary presentation that can be used within courses that deal with case-studies, lab & data collection reports, or persuasive research papers. If you’d like this presentation to be given in one of your courses, feel free to reach out to writingcoaches@paulsmiths.edu to inquire about a classroom visit. Our Writing Center Narratives Presentation teaches students to appreciate the art of storytelling. Within this presentation, our staff discuss the guidelines to writing a great narrative piece, point of view, language use, and audience. This is a multidisciplinary presentation that can be used within courses that deal with case-studies, lab & data collection reports, or persuasive research papers. 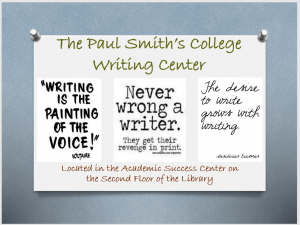 If you’d like this presentation to be given in one of your courses, feel free to reach out to writingcoaches@paulsmiths.edu to inquire about a classroom visit. Our Writing Center Drafting Presentation provide students with an understanding of the drafting process and its importance in the writing process. Oftentimes, professors ask for multiple drafts for a singular assignments. 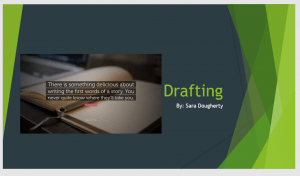 This presentation helps students understand what to look for when revising their first and second drafts. We go over different strategies and techniques that students can replicate with their own assignments. This is a multidisciplinary presentation that can be used within courses that deal with case-studies, lab & data collection reports, or persuasive research papers. If you’d like this presentation to be given in one of your courses, feel free to reach out to writingcoaches@paulsmiths.edu to inquire about a classroom visit. 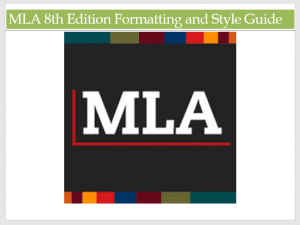 Our Writing Center APA Guidelines Presentation is a great way to introduce or remind your students of the proper APA format and guidelines that you are expecting to see in your assignment. 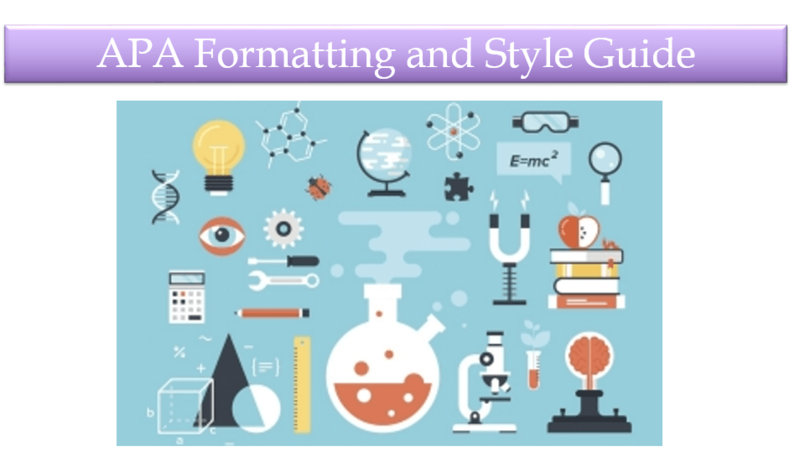 We start with formatting your documents and go all the way to creating your references page. 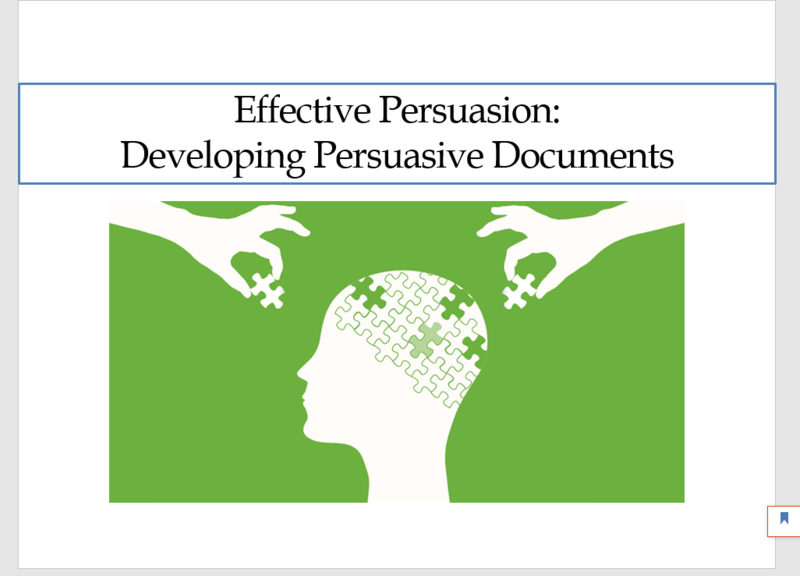 This is a multidisciplinary presentation that can be used within courses that deal with case-studies, lab & data collection reports, or persuasive research papers. 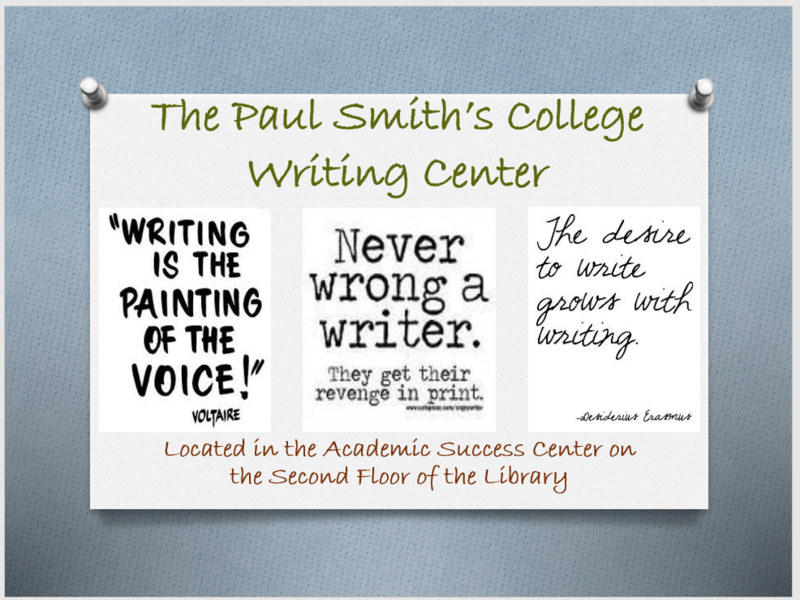 If you’d like this presentation to be given in one of your courses, feel free to reach out to writingcoaches@paulsmiths.edu to inquire about a classroom visit.